Have a classic New York experience on this Greenwich Village walking tour where you'll savor New York's famous pizza, indulge in ice-cold beers and learn about the literary and artistic giants who once called this bohemian neighborhood home. Follow in the footsteps of famous figures like Dylan Thomas, F. Scott Fizgerald and Jackson Pollock as you walk the quaint, tree-lined streets with your guide and visit places locals know and love. 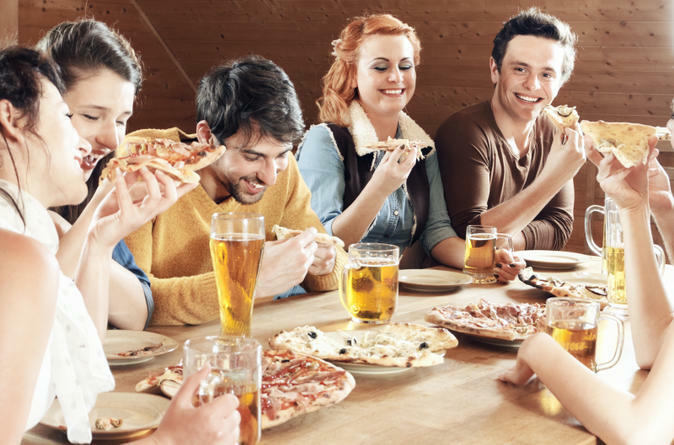 You'll find your three slices of pizza and two beers add up to a satisfying lunch! Meet your guide in the heart of New York's West Village on Bleecker Street. As you walk among the brownstones and boutiques of this quiet, charming neighborhood, learn about its colorful history from your local guide. Hear stories about the many writers, artists and musicians who have been drawn to this little enclave of the big city, including F. Scott Fitzgerald, Dylan Thomas, Jackson Pollock and Bob Dylan. Pizza and beer are as integral to the Village's distinctive character as its artistic legacy. As you wander the neighborhood, stop at three of of these well-known pizza places and chat with the chefs: Artichoke Pizza, Joe's Pizza, John's Pizza and Bleecker Street Pizza. Try different styles of pizza, ranging from classic coal-fired thin crust slices to creations made by recent Italian immigrants. You'll also stop at two famous local bars, Kettle of Fish and White Horse Tavern. Jack Kerouac and Bob Dylan frequented Kettle of Fish, a favorite of the Beat Generation. White Horse Tavern is also known for being a Beat Generation hangout and where poet Dylan Thomas drank himself to death. Soak in the atmosphere of these legendary bars as you indulge in a complimentary beer at each and order additional drinks if you wish (own expense). By the time your 2-hour walking tour of Greenwich Village draws to a close at a bar on Hudson Street, you'll have had a fulfilling meal and will be familiar enough with this famous New York neighborhood to come back and explore it further on your own.